Last night I watched a Hollywood movie called Rock the Kasbah, a movie based on a reality female singers face on a daily basis. The movie definitely shows the role of the Nato and what we Afghans have in common when it comes to our goal. In reality every Afghan seeks the freedom they see in Hollywood, however there is that elephant in the room called fear and its huge. There is always two face to an Afghan man, one protective of the female something that they are taught, and the other face is being attracted to women who are free and both faces are natural instincts in conflict. As we saw in the movie, men are lined up in front of a brothel, while they are hiding the women in Burqa, and won’t let them sing as in the case of the star to be singer. The two conflicts of wanting to have freedom and not wanting to let go at the same time has no religious basis, as men do seek prostitutes even though they are muslim and protect women. In one of the scenes we can see that Bill Murray the manager tries to negotiate with the warlords and ends up being shot in the shoulder, since there is no negotiation grounds based their death threats to the female singer, and the freedom of women. There is a huge question mark at this point, where Bill Murray has put the question on the negotiation table and we don’t know the answer as to why a warlord uses women as an excuse to fight, and there is no doubt in this which is the reality of what goes on in Afghanistan. 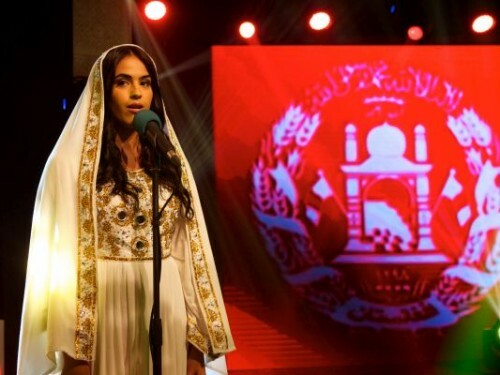 In the “Afghan Star” stage when she sings, there is a fear in everywhere and no one wants to clap and looks at one another despite their inner appreciation for her voice and courage. The movie defines the core of revolution, the fear of expressing what everyone wishes, an elephant in the room, but is too afraid to do. Revelotuion does start from the people the very people who are repressed, the young motivated female dreamers. Nato is not there to bring this dream to the young but is there to help them as a manager to realize the potential and show them that there is resilience amongst the young despite what the American female who escapes with Bill’s money and passport, has, maybe something that the Americans may not have in realizing/achieveing their dreams. The very essential elements of success is there, and Bill Murray is there to steer that power in the right direction and let the female singer shine on the stage, despite all the negativity in a society as a whole. I have believe in the young, to change their own lives one day, to realize that they have survived the decades of war, the poverty, the repression and no one will do this but those who have been doing it so far. There are a few exaggerations something the Hollywood needs, such as finding a girl in literally a cave, which may not be the exact translation of what you may see anywhere but Hollywood. The making of the star, and how this only changes the entire nation, although in reality there are always a percentage that will not change their mindsets no matter how much work is done by the activists. In the end, this movie depicts the realities of what goes on in Afghanistan, the poverty, repression, the concept of the Jungle, and the fact that pearl is made from an irritant, and dust is where the revolution begins in individual and transfers to the society.